"No matter what," she said, "tomorrow ends with blood." Adrien's master plan has been revealed and the battle lines are drawn. With the ashes of the Boulevard still hanging in the air, Hannah and team must race to prepare their ragtag army before the full might of Arcadia descends upon them. While Karl works to whip his troops into shape, Parker invades the belly of the beast, and Hannah and Ezekiel head on diverging paths to seek help. They've made a stand, but can they win the war? Revolution brings the first arc of The Rise of Magic series to an explosive end, finally setting right decades of old wrongs and answering the question of good versus evil. It's an action-packed story, filled with heart, humor, and the never-ending pursuit of justice. AMAZING READ! 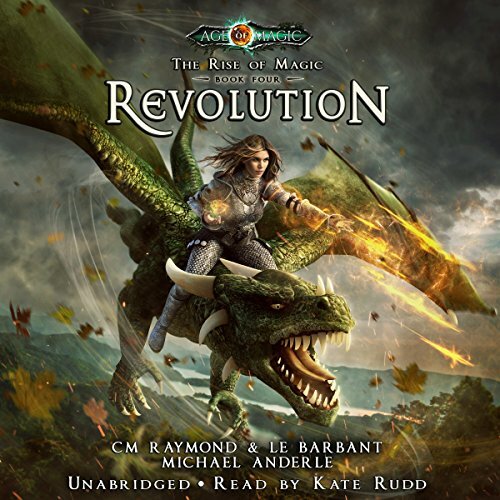 Revolution: Age Of Magic - A Kurtherian Gambit Series (The Rise of Magic Book 4) my fourth read/listen from author C.M. Raymond picks up where Book 3 left off. I love this incredible amazing fantasy. Reminiscent of The Lord of The Rings in scope, the personality of the characters and the voice inflections of the narrator add depth to the listening experience. Well developed characters, a story line that continues to grow on you as you continued until you couldn’t wait to read the finish. A problem with audio books is that you can’t just read faster as the excitement mounts to get to the end faster. I can’t wait to read book 5 in the series. I’m sure that author C.M. Raymond has more good writing waiting in the wings! Another great book. I am glad to see how things turned out for Adrian and a few of his cohorts. I wish some of these things would've happened sooner in the series. Hannah is getting stronger in each book. Karl is my favorite character so far. I love this series, it's so interesting and complex it just grow better in every book. Now in this one I have to say, that at last dead was due, but that ending omg we just hurdle one thing and the next it's so huge it catched my breath. I really do want to know where this series is going to end abd what other trials Hannah and the others will face now.